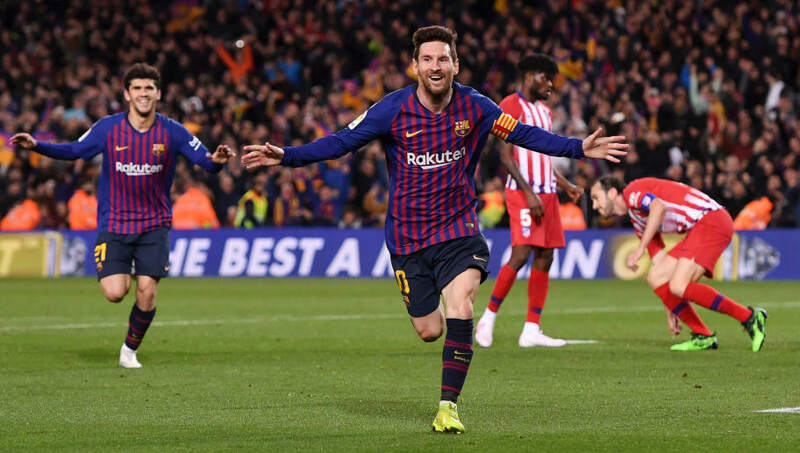 ​A late double from Barcelona was enough to earn them a crucial 2-0 win over title rivals Atletico Madrid at the Nou Camp on Saturday night, taking them to within touching distance of retaining the league title. The game began a lively affair with both sides creating chances, however Atletico's game plan was thrown into disarray on the half hour mark with Diego Costa being sent off after an angry outburst at the referee. Despite going down to 10 men ​Atletico remained in the game and were able to hold out until the 85th minute, however they were eventually undone by a piece of brilliance from ​Luis Suarez - who curled the ball right into the bottom corner from 20 yards out. Then just one minute after going ahead, none other than ​Lionel Messi calmed all the nerves and made sure of all three points with a calm finish to wrap up a hard-fought 2-0 win for ​Barcelona. A win for Barcelona would've all-but secured their status as ​La Liga champions, and they were just about able to do so. Ernesto Valverde's men had scored 15 goals in their previous four games in all competitions heading into the clash, but on the night they ran into an in-form Jan Oblak who looked to be denying everything that was thrown at him as Barcelona lacked a cutting edge in front of goal. Even with Atletico down to 10 men for an hour Barca were struggling, however they were clinical when they needed to be with late goals from Suarez and Messi stealing the win. The result now leaves Barcelona 11 points clear at the top of La Liga with seven games remaining, with seemingly only a major collapse being able to prevent Barca from winning the title. Starting XI: ter Stegen (7); Roberto (6), Pique (7), Lenglet (7), Alba (8); Arthur (6), Busquets (7), Rakitic (6); Messi (9), Suarez (8), Coutinho (7). Substitutes: Malcom (7), Alena (6), Semedo (N/A). STAR MAN - On a night where Barcelona lacked a cutting edge, it was still Lionel Messi who was at the centre of Barca's play. His dazzling runs troubled the Atletico defence all night and really had it not been for an in form Oblak, Messi would've had a field day. It wasn't one of Messi's classic performance that we'll look back on in awe, but he was finally able to get his goal on the stroke of stoppage time which secured the win, and it really was the least he deserved for his efforts throughout the encounter. It was always going to be a tough task for Atletico to go to the Nou Camp and get the win they needed, but their task was made much harder with Costa's red card on the half hour mark. Diego Simeone's men were in the game up until that point, but were then put immediately on the back foot by Barca. In fairness to the visitors they were stern in defence and they did make attacking changes despite being down to 10 men, but Barcelona showed why they are top of the league in crunch time. Atletico haven't beaten Barcelona in La Liga since 2010, and that run will continue as the hosts snatched all three points and left the travelling fans heartbroken. Starting XI: Oblak (8); Arias (6), Gimenez (7), Godin (7), Luis (6); Koke (7), Thomas (8), Rodri (6), Niguez (6); Griezmann (6), Costa (3). Substitutes: Correa (7), Morata (6), Juanfran (N/A). STAR MAN - There were a number of top class performances for Atletico on the defensive end, but had it not been for Jan Oblak it would've been a very long night for the visitors. How on earth  did oblak made those saves??????? The Slovenian international was on top form right from when he was first called into action, pulling off some brilliant saves at crucial times in the game. Unfortunately he was unable to keep a clean sheet and earn his side a point, however he can certainly hold his head up high after a brilliant showing. Having all-but secured their status as champions of La Liga, Barcelona now turn their attention to the Champions League as they get ready to travel to Old Trafford to face Manchester United Wednesday night.  There's the whistle! Barça get late goals from @LuisSuarez9 and Leo #Messi, to sink 10-man Atlético and move to 11 pts clear with seven games to play in @LaLigaEN! As for Atletico, they'll be hoping to finish their league campaign strongly when they host Celta Vigo on Saturday evening.